I have had the pleasure of hanging out with this incredible band. Twice! This was when they played in Bangalore and Mumbai. It was brilliant. The gigs were incredible and so was the time spent with them. I will also admit this. 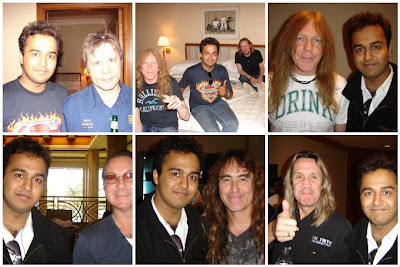 I'm not the BIGGEST Iron Maiden fan in the world...though I do LOVE their music and their energy. I thought that if I'm going to do a Maiden special, I've got to do it right...so to help me out with that, I got a guy who is possibly the biggest Iron Maiden fan...at least in India. Enter Mikhail Madnani (@mikhail666). I've known him for a few years and I can safely say that I don't know anyone else who has more Maiden stuff or knows their music more than this guy. Loved the songs here...and I hope you do too! 36th Song - Iron Maiden - Can I Play With Madness? This album marked the debut of Bruce Dickinson as the vocalist in Iron Maiden. It has been cited as one of the most influential heavy metal albums of all time, and is widely acknowledged as one of the best and most iconic albums of the genre. The album is also Iron Maiden's highest selling album worldwide with over 14 million sales estimated. You already heard the 3 epic songs -"The Number of the Beast", "Run to the Hills" and "Hallowed Be Thy Name" - from this album along with a few other in this show. I now want you to see the making and the history of this Classic Album. Here it is...the Classic Albums feature on The Number Of The Beast!